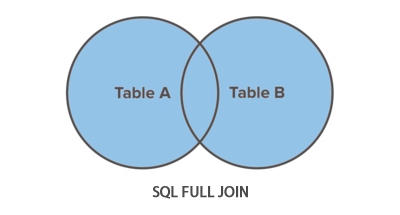 In this tutorial you'll learn how to retrieve data from two tables using SQL full join. A FULL JOIN returns all rows from the joined tables, whether they are matched or not i.e. you can say a full join combines the functions of a LEFT JOIN and a RIGHT JOIN. Full join is a type of outer join that's why it is also referred as full outer join. The following Venn diagram illustrates how full join works. Note: An outer join is a join that includes rows in a result set even though there may not be a match between rows in the two tables being joined. To understand this clearly, let's look at the following employees and departments tables. Now, let's say you just want to retrieve the names of all the employees and the names of available departments, regardless of whether they have corresponding rows in the other table in that case you can use a full join as demonstrated below. The following statement retrieves all the departments as well as the details of all the employees by joining the employees and departments tables together using the common dept_id field. As you can see the result includes all rows from both the departments and employees table. Tip: In a join query, the left table is the one that appears leftmost in the JOIN clause, and the right table is the one that appears rightmost. Note: When performing outer joins, wherever the DBMS can't match any row, it places NULL in the columns to indicate data do not exist.